Green roofs are emerging technologies that can provide a wide range of tangible and intangible benefits to communities interested in enhancement of their environment. Green roof development involves the construction of a vegetative layer on top of a human-made structure or building adding green spaces to areas that would otherwise be unused. The major benefits of green roofs include energy efficiency, reduction in air pollution and GHGs emissions, enhancement in stormwater management and water quality, decreasing heat island effect, aesthetic value etc. Green roofs mainly consist of a vegetation layer consisting of trees, plants, and other shrubs, a substrate layer where water is retained and in which the vegetation is secured, and a drainage layer which helps to evacuate excess water. Green roofs can be intensive or extensive. Intensive roofs are thicker, more than 15 cm deep, which allows for the growth of a wider variety of plants including trees and shrubs. However these roofs are heavier, more expensive and require more maintenance and irrigation. Extensive roofs, on the other hand, are covered in only a light layer of vegetation, less than 15 cm, and are primarily made up of shrubs, low-growing sedums, and herbs. Unlike the plants on an intensive green roof, the extensive vegetation is typically self-sustaining apart from the bi-yearly maintenance when the beds need to be weeded and fertilized. Because of their weight and function intensive roofs are usually used on commercial buildings. Commercial buildings tend to be made out of concrete and can support heavier weight loads than traditional homes. Once the plants are installed and the soil is moist these rooftop green spaces can weigh as much as 150 pounds per square foot. Intensive roofs tend to be more attractive than extensive roofs and can offer people a place to relax, eat or work in park-like settings. Extensive roofs, because of their low weight, tend to be more often suitable for residential type buildings or sheds and barns. Extensive green roofs are the simplest to install and are very often added to existing roofs. Depending on the source you look at these roofs may add 10 to 35 pounds per square foot to a roof’s load. Drought-tolerant plants and grass are the most common used vegetation on an extensive green roof due to their low water requirements and the shallowness of their roots. 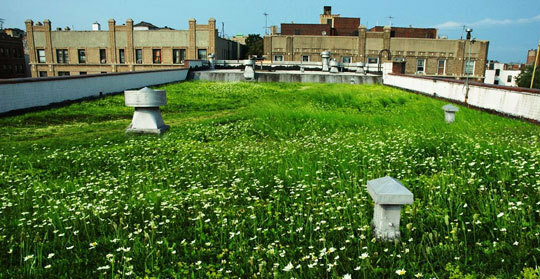 Green roofs can be placed on both old and new buildings.The green roof system can either be modular, with drainage layers, filter cloth, growing media and plants already prepared in movable, often interlocking grids, or loose laid/ built-up where each component of the system may be installed separately. Reports vary on installation costs but on average extensive green roof range between $8 and $20 per square foot and intensive green roofs range between $15 and $50 per square foot. This compared to a traditional roof installation which averages about $16 dollars per square foot the green roof installation costs tend to be much higher. Although a higher installation cost is required, the green roof undoubtedly offers more benefits than a traditional roof may offer. Green roofs have the potential to reduce energy demands two ways: absorbing heat and acting as insulators for buildings. Adding a layer of soil and plants to a roof adds insulation to the building it covers. Since roofs are the site of the greatest heat loss in the winter and the hottest temperatures in the summer, the greater insulation offered by green roofs can decrease the amount of energy required to moderate the temperature of a building. Furthermore, reducing the demand for energy consequently reduces air pollution. By lowering air conditioning demand, green roofs can decrease the production of associated air pollution and greenhouse gas emissions such as CO2, coming from power plants. Additionally, because plants through photosynthesis convert atmospheric CO2 into oxygen, the plants on green roofs can help filter harmful noxious gases in the air and reduce CO2 emissions in the atmosphere. Catherine Hansen is a returned Peace Corps volunteer and graduate from West Virginia University, where she studied for her Masters in Sustainable Development. She recently returned from a 27-month service in Morocco where she was serving as a Youth Development volunteer designing literacy, health, and environmental programming for youth in collaboration with local associations and volunteers. One of her main life goals is to share her passion for protecting the environment from human harm by bringing awareness to environmental issues that are often times over looked.Through outreach and education, Catherine hopes to inspire a refreshed appreciation for our natural world. She aims to begin her career in environmental services within the year.